In this week of prayer for Christian unity, I have an article on the Toronto archdiocesan webpage – or more like a few brief answers to questions – on the life of Saint Francis de Sales, ecumenist par excellence, who brought thousands of wandering souls – heretics, to give them their canonical term, whatever their personal level of culpability – back into the folds of the one, true, holy Catholic Church in his tenure as bishop of Geneva during the height of the Protestant revolution. We should pray and offer up what we can for the noble cause of unity that goes under the oft-misunderstood rubric of ‘ecumenism’. As the Second Vatican Council teaches, perfect unity already ‘subsists’ in the Catholic Church, but not all – including Catholics – live out that unity. Hence, the primary principle in ecumenism is ‘interior conversion’, that is, most of all, the continued growth in holiness of Catholics themselves. 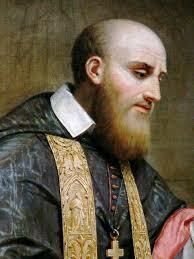 As the Devil purportedly said to Saint Jean Vianney, ‘if there were but three priests like you, my kingdom would be destroyed tomorrow’, something Satan also thought of Saint Francis de Sales. He converted far more by his holiness than by his words; or, should I say, that his words were given far more effect by his own, incessant ‘interior conversion’. As the saint put it, He who preaches with love, preaches effectively. Stories are told of his remarkable patience, and this in a man who, by his own admission, was tempted sorely to anger and impatience, something no one ever really knew. Au contraire, his graciousness – in all that word implies – was renowned. As the vacillating king, Henry IV, confessed upon meeting the good bishop, to whom he became quite devoted: A rare bird, this Monsieur de Genève, he is devout and also learned; and not only devout and learned but at the same time a gentleman. A very rare combination. Need it be said, that this should be a less rare combination? I would dare add that if more of us – that is, the laity, who comprise about 98% of the visible Church – were what we should be, we would, like Saint Francis in Geneva, have trouble accommodating all the conversions, and unity would be more a reality than a vaguely realized syncretism. One way towards our own ‘interior conversion’ is to read over and put into effect Saint Francis’ classic Introduction to the Devout Life, or his Treatise on the Love of God, which are as relevant and applicable today as they were in the 17th century. No wonder he was declared one of the elite 36 Doctors of the Church by Bd. Pius IX in 1877, and is the patron saint of writers and journalists. And while on journalism, and the degradation thereof, is Twitter evil, as some commentators have put forward, in light of the ‘Covington school’ fiasco? Well, no technology is intrinsically corrupt, for any ‘thing’ – any existent good – can be put to good use in some way. But some things tend more towards evil, offering certain temptations for fallen Man, who now has a ‘disposition to evil’, as Saint Thomas puts it, a result of that original sin of our forefather Adam. Words are sacred – one of the reasons that lying is evil – and to reduce our conversation to hash-tag sound-bites as a normal means of communication seems to be corrupting not just our speech, but our minds and our access to the truth. This opens larger questions – as most things do for those who still not lost that wonderful gift of wonder – about the nature of the good, truth, beauty, to which so many have become inured, even blinded. One essayist – who has spent countless hours perfecting his craft – bemoans the fact that his niece gets millions of ‘hits’, and makes a sizeable income, for making ‘duck faces’ on YouTube. Why bother, he wonders? Why not just join the madding crowd, off the cliffs of inanity, to paraphrase the Princess Bride? My response? Well, because it’s worth it, and the primary purpose of any ‘work’, as Pope John Paul II taught, is to make us, the worker, more perfect, more fulfilled, more apt for heaven. For we will only be judged on the good – and the not so good – we have done, or not done.